New Ice Climbers Game + Playable Demo!!! That was not clickbait. I have created new concepts for an Ice Climbers game and there is a playable demo level that you can go try right now. Yes, I’m nuts. Perhaps I’m the only person who still loves the original Ice Climber for NES. It’s hard, the controls are not modern, but somehow I still love how it plays. It was such a simple concept: Climb up a mountain, kill birds and monsters, get vegetables. Nintendo has an eye for taking simple concepts and weird premises and making them into games. It’s wonderful. A condor takes the Climbers for a ride! Woo! Unfortunately, there was never a followup to Ice Climber. Super Smash Bros. brought them back in a major way, reenvisioning the characters and pairing them as a team. Smash 64 had been my favorite game, and when they added my favorite retro game’s lead characters, it was like heaven. But, unlike Pit with Kid Icarus, the Ice Climbers never got a new game. Well, I changed that over the past month with my new demo…. ICE CLIMBERS: DAWN OF THE EGGPLANT! It uses the LittleBIGPlanet 2 engine for Playstation 3. I wired sackbots to become playable Ice Climbers that function as a team (like in Smash). It’s pretty neat, so I hope that you check it out! In LBP2, search for “Ice Climbers: Dawn of the Eggplant” or search for my PSN username, which is “oxyborb” to try it out! Also, if you play my demo, you get the assets I've made to make your own Ice Climbers level! No joke! Go make more and leave a comment so I can try it too! Click here to see my level's page! I created this to bring fresh ideas and attempt to modernize Ice Climbers a bit for a new game. I hoped someday, maybe, someone at Nintendo might see it or play it and realize the potential for a new game. There are multiple powers you can choose from as you navigate the level. The Ice Shot from Smash is in, and, as you can see, it launches a freezie along the ground. Other ideas from Smash I’ve brought over are the ability to throw tethers from Nana to Popo so that you can scale mountains. 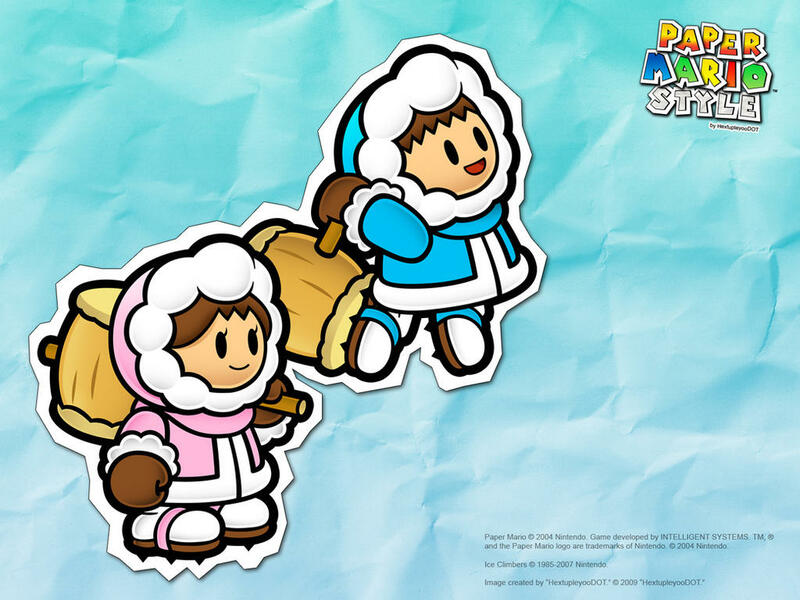 I imagine if Nintendo made a new Ice Climbers game, you might see more of the duel hammer twirling and stuff, but I didn’t include that due to the limitations of LBP2’s engine. picture of Popo fighting a Topi enemy. In my level, you can also choose to throw mallets into the air. New ideas I came up with include a freeze gun that you can use to build bridges across gaps, the ability to grab your following ice climber and throw her, and a giant iceberg attack to flatten enemies. You can also use the iceberg to get across water, since polar water is too cold to swim in. It’s pretty neat to hop from island to island like this. The art style for a true sequel to the game could be very well done in a Paper Mario cartoon look, as can be seen here, but my fantasy is that the new game would be developed by the same people that made Castle Crashers, The Behemoth games studio. That art style mixed with frantic mallet mashing would be awesome! I actually talked to one of the developers when I went to PAX Prime about that idea, but he seemed disinterested. Oh well. I’ve also thought about how cool a 3D game would be, like… what if the first level from Super Mario 64, that one with the giant mountain, were like an Ice Climbers game. Climbing to the top to win. That would rule. However, I feel like a downloadable game might be more of a good first step to bring them back and make them popular again. Anyway, that’s my concept, go play my demo! Nintendo, if you’re listening, feel free to email me, oxyborb@gmail.com. I got more ideas in my head for you! Hahaha, as if. I also made a killer Pikminlevel in LBP2 where you control an army of pikmin in a sidescroller. It’s awesome! For a grand finale, here’s a sneak peak of the demo’s boss! I've had a falling out with political discussion. I just don't like it anymore. I used to enjoy debating politics with people, but there have been a few changes in my life that made me... not necessarily apathetic, but... I just don't want any part in the discussion. For one thing, I want to publish books, and I don't want anyone to not purchase my books on the basis of my political orientation. I know that's a cop-out, but it's true. I want to write books for children, and I don't want ______ political person to hate me so much that they won't let their kid read my work. My work is non-political; I just want to tell fun stories and get kids reading. If anything, literacy for kids is my personal mission. I think there comes a point where a writer needs to decide if they want to be all-encompassing or politically motivated, and I want to be all-encompassing. I want liberals and conservatives alike to buy my books and enjoy them. I plan to never donate money I make off of books to political causes (FYI, the thing I want to donate money to is clean drinking water charities for poor people in other parts of the world). I want buyers to be at-ease with me. I really do. The second motivation I have for being a-political is the bigger reason: I just want to love everyone. My oldest friend told me once that she didn't like certain people on facebook because they were always angry about politics, and it enlightened me. Who does like someone who is always angry? Not me. Slamming other people based off of their values and feelings is useless and makes you hold anger in your heart. You see this sort of thing a lot on twitter trends. Hashtags like, #SayThreeWordsAbout(insert political group). That kind of thing does nothing but spreads hate. Pulls us apart. I think the only way for any good to happen is to come together, and political debate does nothing for unity. Most people don't care if they're wrong. This was a huge realization for me, because I truly care to know when I'm wrong/mistaken about things. I like to be corrected if I get my facts messed up. I like to see where other people are coming from. I admit when I'm wrong. Truth is, though, most people don't want to know if they're wrong. Even if they do know, most people don't care. Most people don't care if the logic doesn't flow; they'll keep on debating the point long after it is disproven. This is the essence for why debate does nothing, I've found. People want to be heard, not to hear. So, although I'm not apolitical or apathetic, I have chosen to back off of it completely, for my writing career and for myself. Kind of an oxymoron, right? Well, that is what I wanted to attempt to do in this previous blog post. That was in December of 2013. I know, crazy, right? Why didn’t I ever update my blog about my progress? I know, excuses to not follow through with weight loss are a dime a dozen, but I ran into an issue. I had been doing so well for like 3 weeks, checking every day and doing an hour of exercise. Eating healthy and nixing my soda intake. But… then… my Wii Fit game disk got scratched up so bad it wouldn’t work. My Nintendo was on the fritz, too. So, yeah, I sorta got discouraged. And busy, and excuse, excuse… sorry. BUT NOW I’M BACK, FROM OUTERSPACE! I bought myself a Wii U and the new version of Wii Fit, which comes with a step-counter. It’s a much-improved version, and so I’m going to once again try and make this diet thing happen. No, really. I mean it. I’ve been tooling around with it, trying to decide which games and exercises will be a regular part of my workouts. I dig the new rock climbing game and the water-shooter. The trampoline isn’t fun, but it got my heart beating. I took a walk—I really love the new step counter. It tallies up your steps and calories like experience points and shows how far you would have gotten if you had been in New York or other major cities. It’s fun. Because I need working out to be a game. I need it to be like earning experience points, because working out hurts and is boring. I’m not a hamster; I don’t like running and running and not getting anywhere, not doing anything else. Video game workouts seem to me to be the one thing that might make my mind occupied enough to keep at it. I am going to try and do another blog about this after doing this for a few weeks, so I’ll update here if I do. Click that little follow button on the sidebar to keep up with my posts! Follow me @Oxyborb and check out my website at http://www.harrisonaye.com Thanks for reading!